I've one illustrator file. The artboard takes much less than 1/4 of an A4 page. I would like to print 80 copies of it, 4 on each page. Is it possible? I know that I can export the image, then ask windows to print them 4 by page, but I will loose illustrators options(trim marks by example). So, is this possible with illustrator? What is the best way to do it? In the future I will have to do this regularly. That's my print dialog with the set up to 4 pages per sheet. Click the Setup button to bring that second panel. 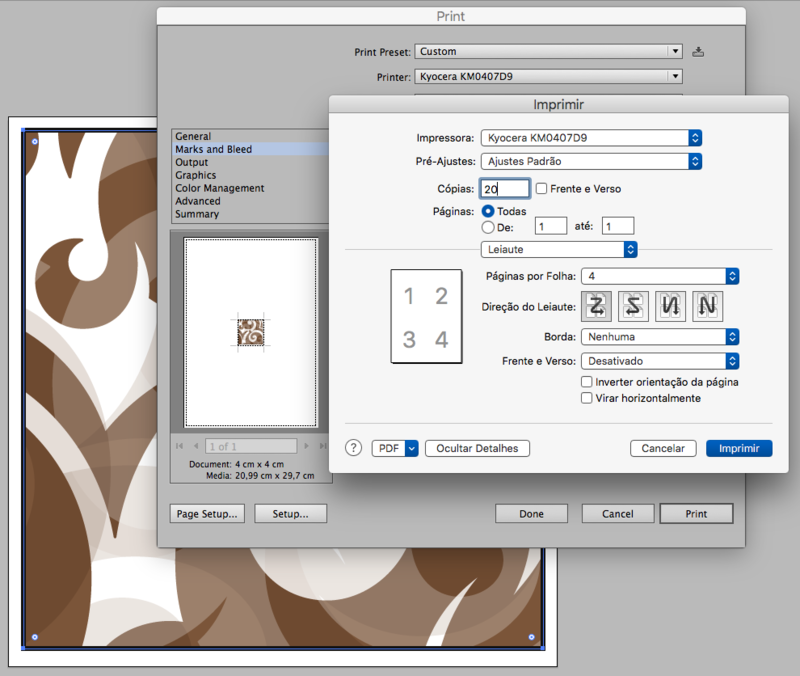 Drag it all to the Symbols Panel to create a symbol of your artwork with the marks. Place as many of the Symbol instances as you like on the A4 artboard. They'll all have crops. If you need to edit the original, double-click the Symbol in the Symbols Panel to edit it. One symbol, used as many times as you like. This won't increase file size and allows you to control the layout of the "multi-up" page. Best fill page with image tiled - mosaic? How do I create a multi paged pdf from Illustrator with different layers lighted on each page? How to Print Product Label copies 3-across on 3UP Label Paper?